Do you want to subscribe to an Artist’s Gigs feed via iCal on your iPhone? Follow these easy instructions and you can always stay in sync. Tap on the “Settings” icon from the iPhone’s home screen. Tap on “Mail, Contacts, Calendars” from the list of device settings. Tap the “Add Account” button and select “Other” in the list of account types. Choose the “Add Subscribed Calendar” option at the bottom of the screen. 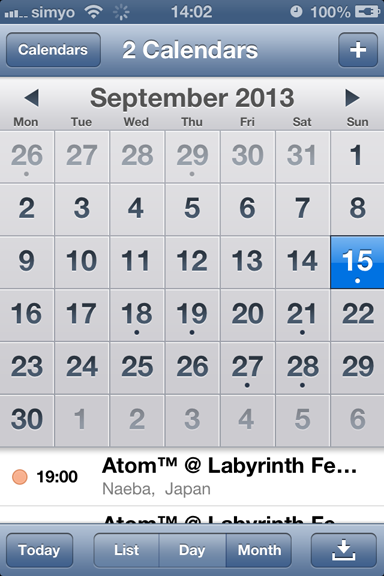 Enter a description for the ICS calendar and tap “Next” once more to finish adding it to your iPhone. This entry was posted on Wednesday, August 28th, 2013 at 1:59 pm and is filed under Help. You can follow any responses to this entry through the RSS 2.0 feed. Both comments and pings are currently closed.